Rangeland Field Day, Saturday, April 27, 12pm to 3pm--Tickets on Sale Now! Experience Paso Robles springtime in our pasture. The tasting room will be closed on April 27 and we will be enjoying the afternoon in the adjacent field at 6996 Peachy Canyon Rd. 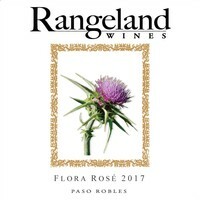 Your Rangeland Field Day ticket covers wine tasting, including the newly bottled Flora Rose', as well as a BBQ lunch featuring our beef and lamb, local sausage and other treats. There will live music and livestock displays, including cows, calves, sheep, lambs and horses. You'll get a chance to hike or take a hayride to the top of the property, which has stirring views of the surrounding countryside. Your spring wine or lamb club shipment will be available for pick up that day as well. Attendance is limited. $50 per person, and club discounts apply. For this event, no dogs allowed. Purchase tickets here. 2016 Ultramafic (100% Merlot) - new! 2015 Cabernet Sauvignon - new! Please update your credit card and shipping information, if necessary, at www.RangelandWines.com. You can use your email address to retrieve your password to login. Also please let us know by email if you'd like to customize your spring shipment. All the available wines are listed here. We're readying the spring Lamb Club for shipping in April, in time for Easter. 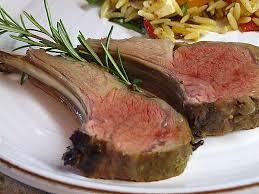 Lamb Club members should be on the lookout for an email about their shipment in the next few weeks. Wine club members can also order the 20 pound box, which sells for $300 before your club discount. The Lamb Share box includes a rack of ribs, loin chops, 2 small leg roasts, shoulder chops, riblets, stew meat and/or shanks, and 1 or 2 pounds of ground lamb. We'll also have 10 lb. boxes of ground lamb available again. Order lamb here. Private tastings are available by appointment with our winemaker Paul Hinschberger. He will guide you through a selection of wines (current, library, or not-yet-released), sharing his knowledge about grape varieties, vintages, source location and the wine making process. We hope you'll come away with a new appreciation of winemaking styles and the unique properties of our vineyard and Paso's westside. By appointment only, the price is $50/person before club discounts, and each pair of guests leaves with a bottle of wine. Minimum party of 4, and allow at least 1 hour for the tasting. Request a tasting by filling out our appointment form. Like all of California, we've had abundant rainfall this winter, already totalling 40 inches, or about 120% of average for our ranch. The rain was generally steady, without damaging gully-washers. We did, however, have some booming thunderstorms and microbursts--intense downdrafts from towering cumulus clouds. These stormlets featured screaming surface winds and hail that rattled windows ferociously and took out many trees. So the chain saws have been busy keeping roads clear and fences whole. Bud break (emergence of green leaves) in both the grapes and oaks has been deferred versus recent years by the cool, wet weather. Kind of feels like old times, as the metronome of climate change ticks cooler under the influence of a mild El Nino. This wet winter sets the stage for a colorful spring wildflower bloom. It also foretells an abundant year of livestock forage and likely a good wine grape crop--assuming we have good weather at bloom time (May) which allows the grapes to "set" properly. We'll keep you posted as the vintage develops. 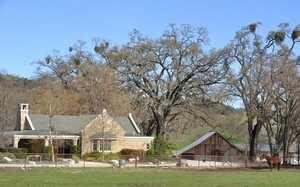 Our new tasting room opened January 3 at 6996 Peachy Canyon Road (at the corner of Vineyard Drive) and we have been busy! We so appreciate club members, friends and neighbors stopping in to check out the new digs. We're also meeting new guests who've come in to enjoy our scenic 50 acre farm. It is very pleasing for us to watch our visitors fall into the "country trance" as they gaze out over the pond, pastures, historic barn, orchard and heritage oaks. It reminds us of the "ranch fugue state" experienced by visitors to our home. We like to think we are offering the peace and pleasure of being connected to the natural world. That's a hard thing to find in our modern, tech-driven existence. You are welcome to bring a picnic or snacks to the tasting room. You can dine outside on the patio or by the pond, or inside by our fireplace. We look forward to seeing you! Hours are Thursday - Monday, 11am - 5 pm. We're excited to announce private tastings with our winemaker Paul Hinschberger. He will guide you through a selection of wines (current, library, or not-yet-released), sharing his knowledge about grape varieties, vintages, source location and the wine making process. 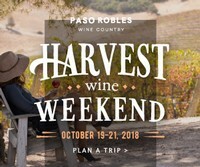 We hope you'll come away with a new appreciation of winemaking styles and the unique properties of our vineyard and Paso's westside. By appointment only, the price is $50/person before club discounts, and each pair of guests leaves with a bottle of wine. Minimum party of 4, and allow at least 1 hour for the tasting. Request a tasting by filling out our appointment form. We're introducing two new club formats to encourage loyal customers. If you or anybody you know is on the fence, now's the time to jump off and join! Our first ever 4-bottle club, the Intro Club ships 4 bottles twice a year, in fall and spring. Club boxes run approximately $125 before tax and shipping. Intro Club members receive 15% off all wine, merchandise, and beef/lamb; complimentary tastings for 2. Sign up here. We're increasing the Case Club discount to 25%. If you're already in the Case Club, you'll notice that deeper discount when you purchase your next bottles. And if you've been in the 6-bottle Estate Club, consider upgrading to enjoy more wine at better prices. As always, the discount applies to all Rangeland products (meats, events, merchandise like cool hats and corkscrews), and allows free tastings for up to six people, any time you visit us. Sign up here. We treated all of our January visitors to a taste of our 2014 Limestone Reserve Cabernet Sauvignon, a wine we ordinarily reserve for club shipments. It's been pouring very nicely: fruit foward but with that elegant, mineral edge and supple mouthfeel. We're offering a 2 bottle special of 2013 and 2014 Limestone Reserve Cab for just $80--before club discounts. Place your order here. Two for $200 each ($400 total), before club discounts. Killer price. Order here. 20 lbs. for $160 before club discount. Order here. Taste traditional Paso varieties like Zinfandel and Petite Sirah, as well as other Rangeland selections. We'll feature a Zin vertical special for purchase. We'll be grilling our grass-fed beef sliders on Saturday only, for purchase, from 12-4. You're welcome to picnic on the grounds. Rangeland Field Day, Saturday, April 27, 12pm to 3pm--Save the Date! The tasting room will be closed, as we will all be enjoying the afternoon in the pasture of our new tasting room property. Field Day includes a BBQ lunch (featuring our beef and lamb), live music, live animals (cows and calves, ewes and lambs, maybe our horses!) You'll get a chance to hike or ride to the top of the property, which has stirring views of the surrounding countryside. Your spring club shipment will be available for pick up that day as well. Save the date; more info to come! Special wine tastings including our new 2018 Flora Rosé. We'll be grilling our grass-fed beef sliders on Saturday only, for purchase, from 12pm to 4pm. You're welcome to picnic on the grounds. $1 shipping on all December orders. Use coupon code $1ship on RangelandWines.com or send us the order info by reply email. Mistletoe Special, 2 bottles for $50 before club discounts. We sold out of the 2015 Mistletoe but we are extending the offer with the dark, luscious and fruity 2016 Mistletoe, a blend of Cab, Syrah and Petite Sirah. Order now! Bordeaux Special. $110 for three bottles. One each of the 2014 Limestone Reserve Cabernet, 2015 Cabernet Sauvignon and the 2014 Watershed. Order now! Follow the Bouncing Rangeland Ball to...Vineyard Drive! Starting January 3, 2019, we are opening a new tasting room on Vineyard Drive, at the corner of Peachy Canyon. 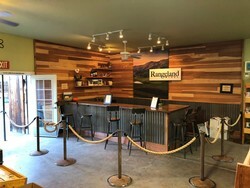 The new Rangeland Wines tasting room address is 6996 Peachy Canyon Road in Paso Robles. Our expanded tasting room hours will be Thursday to Monday, 11:00 am to 5:00 pm. We are closing our Templeton tasting room permanently on December 30 at 3:00 pm, our last day there. After years of limited public access to Rangeland Wines at the ranch and more recently at our small tasting room in Templeton, we are pleased to own an already permitted tasting room and small winery on the "main drag" of Paso Robles westside wine country. This property has grand heritage oaks, an old barn and walnut orchard. So after years of seeking, we will finally be making and selling our wine in one scenic, accessible location, just a couple of miles from our Adelaida Springs Ranch. We are excited about this new chapter. It is the capstone to a long quest. It's also a big commitment for Lisa and me, but we are striving to make our ranch and winery financially as well as environmentally sustainable, so we can conserve its natural beauty permanently. When you support Rangeland wines and meats, you get authentic local, natural quality and you are helping conserve a 1,500 acre swath of pristine California oak woodland, with all the thriving wildlife and natural beauty largely intact. We so appreciate and need your help! We will be sharing the new tasting room with another small winery. More on that when they are ready to occupy after the New Year. We also hope to offer ranch tours and food from our new location, but it will take some time to pull those offerings together. Watch our newsletters for updates. Warm thanks to Melanie Blankenship and Teresa Rojo-Branch and the rest of the crew at Nature's Touch in Templeton. They have been our landlord and food preparation partners for the last 14 months. It was great to be in the heart of the small Templeton community. We enjoyed sharing our grass-fed meats and estate wines with our customers there. We'll miss our "regulars." We encourage our customers to continue to patronize Nature's Touch for their good natural food and organic produce--including grass-fed beef sliders and nachos! We've had a number of inquiries about whether our mixed case special is still on and yes it is, until Setember 30! You get 10% off (in addition to your club discount), for any 12 bottle case of wine--your selection. And we'll ship it to you for just $1. For example, if you are an Estate Wine Club member and you purchase a case, you get 30% off and save $34 on the shipping too. To order cases, please email me, because we have to manually enter the discount to achieve this special price. This deal cannot be combined with other specials. For a full list of our current and library wines, go to www.Rangelandwines.com/wines. We made a little more Rosé this year so, unlike last year at this time, it is still available and our special ($100 for six bottles, before club discount) is also available through month end. Don't forget that our Rosé pairs beautifully with holiday turkey and makes a great, affordable gift. Order here. Join us for a sit-down, small plates brunch, tent-casual, on Harvest Wine Weekend, Saturday October 20 or Sunday the 21st, 10am to noon. Winemaker Paul Hinschberger will guide you through a vertical tasting of Rangeland Wines, including a barrel sample. Each tasting will include at least five wines and be casually paired (let's not overthink this!) with farm fresh foods, including grass-fed meat, local charcuterie, eggs, chesse and, of course, something fresh baked and sweet from the oven. Limited seating, so reserve your space early. $50 per person. Club discounts apply. Our pickup has been rescheduled to Sunday, November 11, 12 noon to 2:00 pm. Free to all club members, we will feature estate meats and wine, as usual. More details about this party and fall wine club and lamb club shipments will follow in our next newsletter. After a cool spring and some brutal heat this summer, the weather has leveled out nicely. The vines are looking good for harvest with a generous, healthy leaf canopy and normal crop level--all turning dark right on schedule. That means at least 160,000 pounds (80+ tons from our 40 acres) of grapes are waiting to be picked by hand. A vineyard is really a miracle of fecundity. Our 2018 Sauvignon Blanc is already in the tank and fermenting. Our little team picked some fruit for the new Rosé just this morning. See photos. Wish us luck and anticipate the results with relish. We are getting better at this every year and it really shows in Paul's beautiful wines. 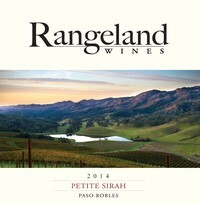 If you are low on your favorite Rangeland Wines, now is a good time to restock. We are offering 10% off (in addition to your club discount), for any 12 bottle case of wine--your selection. And we'll ship it to you for just $1. For example, if you are an Estate Wine Club member and you purchase a case, you get 30% off and save $34 on the shipping too. To order cases, please email me, because we have to manually enter the discount to achieve this special price. This deal cannot be combined with other specials. This deal is valid until September 30, 2018. For a full list of our current and library wines, go to www.Rangelandwines.com/wines. Record heat recently has us reaching for a chilled glass of our beautiful 2017 Flora Rosé or our newly released 2017 Sauvignon Blanc. We still have a special on the Rosé (6 bottles for $100) but our stock is down to the last pallet, so order now. The 2017 Sauvignon Blanc ($30), our first ever, has become an instant favorite. This crisp white combines floral aromas and subtle, exotic fruit flavors in a refreshingly delicate package--just 12.9% alcohol. Put a few bottles in your mixed case or order separately. We have some additional beef club boxes this year, available to all. If you are going paleo or just love flaveo, you gotta have this nutient dense superfood. Beef, wine or lamb club discounts apply to this purchase: that's $200 for club members, $250 for non-club members. The 25-pound box contains 6 pounds of steaks, 6 pounds of roasts, 8 pounds of ground, and 5 pounds of extras (think stew, kabobs, shanks or shortribs). We even toss in a soup bone or marrow bone package after reaching the 25 pounds. It only takes up about 1 cubic foot in your freezer. To order a beef box, click here. Be the only one on your block to own a fine, French oak wine barrel. We have some used wine barrels for sale, $50 each with a Rangeland logo branded on the head, $40 without. They must be picked-up at our Templeton tasting room. Update: we sold all of our barrels. After a cool spring, record heat descended on Paso Robles and much of California in July. It has been over 100 degrees in Paso Robles for the last two weeks, with peak heat of as much as 110. Despite the heat stress, the vines and livestock seem to be holding up pretty well. We branded our calves without (much) harm to man or beast. Our grapes are showing some color, so harvest will likely kick off around Labor Day, as usual. Our people are also proving adaptable: starting extra early, wearing hats and staying hydrated on that good Adelaida Springs water. They drink the occasional beer, invoking that old saying, "It takes a lot of beer to make good wine." We installed air conditioning in the tasting room and added misters and more shade on the patio. 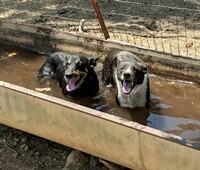 The ranch dogs are taking frequent baths in the water troughs, the lake and even the swimming pool. While we are by no means exempt from the threat of wildfire, we use the grazing sheep and cattle to minimize the property risk and reduce the potential intensity of a wildland fire. We are doing our part to farm sustainably and store some carbon in healthy soil instead of the atmosphere. Let's hope we can all make progress on this climate change thing. It's important not to confuse mere weather with the broad trends in the climate, but I think we are standing before a sign, etched in fire on a global scale. It says: WARNING! To celebrate Zin Fest, we're offering a 2-bottle Zinfandel vertical (2014 and 2015) for just $50--that's before your club discount. If you make it a case (6 specials = 12 bottles for $300, before club discount), shipping is free! It should be fun to compare these two vintages. The 2014 vintage is complex and refreshing, with interesting earthy notes--a Zin for Pinot lovers? The 2015 Zin is wonderfully fruity, with a rare lightness and balance for Paso Robles. Order online here. We're readying the spring Lamb Club for shipping later this month, in time for Easter. So Lamb Club members should be on the lookout for an email about their shipment. Wine club members can also order the 20 pound box, which sells for $200--20% off. The Lamb Share includes a rack of ribs, loin chops, 2 small leg roasts, shoulder chops, riblets, stew meat and/or shanks, and 1 or 2 pounds of ground lamb. We'll also have 10 lb. boxes of ground lamb available again. Order lamb here. All club members (Wine, Beef and Lamb) are welcome to our spring pick-up party! You can taste the wine club line-up, pick up your wine, and enjoy some delicious grass-fed beef tacos, assorted salads and desserts in our garden setting at the Tasting Room. Ground lamb and beef boxes will be available for sale. This event is complimentary to club members and a guest. Space is limited, so reserve your spot now by clicking here. We're pleased to introduce our new tasting room associate, Hayli Macomber. A Templeton native, Hayli recently returned to the Central Coast after several years in New York. We feel very lucky to have her. Please stop in and welcome her to the Rangeland family! It's been a crappy winter on the Ranch, rain-wise, so our pastures are struggling to stay green. March, however, has come in like a lion and shows some promise of rescuing us with rain last week and more in the forecast. Nevertheless, we are staying busy in good weather and bad. Winemaker Paul Hinschberger and a crew of volunteers bottled 800 cases of wines in February, including some 2016 reds, the 2017 Rosé and our first ever Savignon Blanc. The volunteers included the "Bottle Beast" Jeremy Thompson, a local club member who has lifted literally every Rangeland bottle onto the line for the last five years. His diligence and strength have been rewarded with Rangeland Wines, of course. Vineyard Manager Patrick Hamilton guided a small army of contract laborers through 40 acres of pruning last month and the sheep are happily grazing the vineyard cover crop he planted last fall. Now, If only Patrick could keep his midget dog Rebel from trying to copulate with our Great Pyrenees teenager Daphne. At one point Rebel drove her, (or did she lead him?) on a wild escapade miles off the ranch, which ended with them both in the San Luis Obispo county humane society penitentiary for deliquent horny pets. My adorable, hardworking but wacky wife Lisa often feels like singing "It's the most wonderful time of the year" in March, when there are baby lambs and calves being born every day on the ranch. But all this livestock and the drought conditions make work very lively for Ranch Manager Dane Jensen. He has to move the animals and feed them hay much more frequently in a drought. Dane still manages to look like Clint Eastwood, even as a couple of hundred sheep scatter wildly through my household landscaping and a geyser of water rises from the irrigation pipe they just broke off. Just another day at Adelaida Springs, aka Calamity Ranch. Despite some frost in the canyons this morning, we've had a mild fall with just a few spritzes of rain. We are grateful that green grass has started in most places on the Ranch but we're worried about the relatively dry, unseasonably warm weather. At Woodstock back in '69, young people in a drug-addled frenzy chanted for "No Rain." Here, now, in the Adelaida hills, we old farts, somewhat wine-addled, are definitely chanting for MORE RAIN! We'd even take snow at this point, like we received in February of 2006. Whether you are appreciating your loved ones or treating yourself this holiday season, think about our vivid Rangeland Wines, the goodness of our grass-fed meats and the pristine slice of old California that we are conserving here at Adelaida Springs Ranch. For delivery by Christmas, place out of state orders by December 15. California, Nevada and Arizona are served by Golden State Overnight, so we should be able to fulfill Christmas wine orders to these states up until December 19. We are offering a Mistletoe special this month; 2 bottles of 2015 Mistletoe for $50, a $14 savings before your club discount. This 2015 vintage includes Cabernet Sauvignon 46%, Syrah 27% and Tannat 27%. The Tannat seems to give this wine a spicy complexity and tart vivacity that pairs wonderfully with rich foods, which--at this price-- includes your favorite night pizza any night of the week. You can place multiple orders to different addresses to knock out your holiday gift list. Order here. Order a full case of Mistletoe and get 20%, on top of your club discount. This lowers the price below $20 per bottle for wine or meat club members, so stock up now. We've updated the Bordeaux special to inlude the 2014 Cabernet Sauvignon, which is a nicely fruit forward but still balanced rendition. The 3 bottle selection also includes the 2013 Watershed (Cab, Cab Franc, Merlot and Petite Verdot) and 2013 Limestone Reserve Cabernet, for $110--that's a savings of $20 before your club discount! Order here. For California, Nevada and Arizona shipping addresses we have begun to use Golden State Overnight for meat shipping. We have 25 pound Beef Intro boxes of mixed cuts, as well as 10 and 20 pound boxes of ground beef. Order now and shipping is free. We are out of lamb while we wait for our 2017 lambs to fatten for the spring. Our tasting room is now open at 225 South Main in Templeton, Thursday through Saturday, 11 to 5. You can pickup wine there during business hours or just drop in for a tasting, complimentary to club members and their guests. You can also pickup our meats there by appointment or arrange an off-hours tasting.